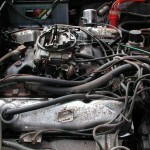 Photo of engine from the offside. 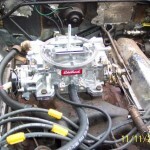 The carburettor is a Carter AVS 4682S C.A.S. identified by the triangular aluminum tag. Note the Mopar Workshop Manual at page 14-42 (fuel system-AVS ) states that the 383 engine was fitted withAVS-4736S or AVS-4732S. This evidently refers to other Chrysler engines and not the Jensens’ 383.Other Jensen 383 engines of this age also have the AVS 4682S. 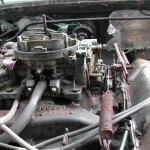 Note the adjusting screw in the center of the carburetor. I don’t know what it does? 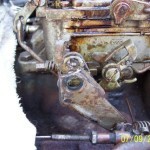 “I have just removed the carburettor. It is a Carter AVS C.A.S. 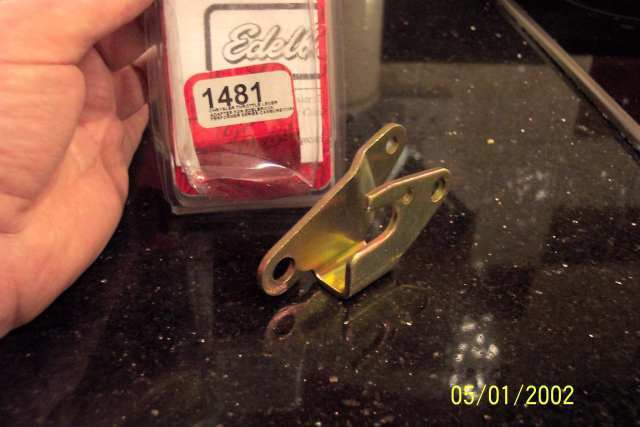 It has a triangular aluminum tag identifying it with the reference 4682S beneath that No. is the code 2618 and to the right side is “95”. 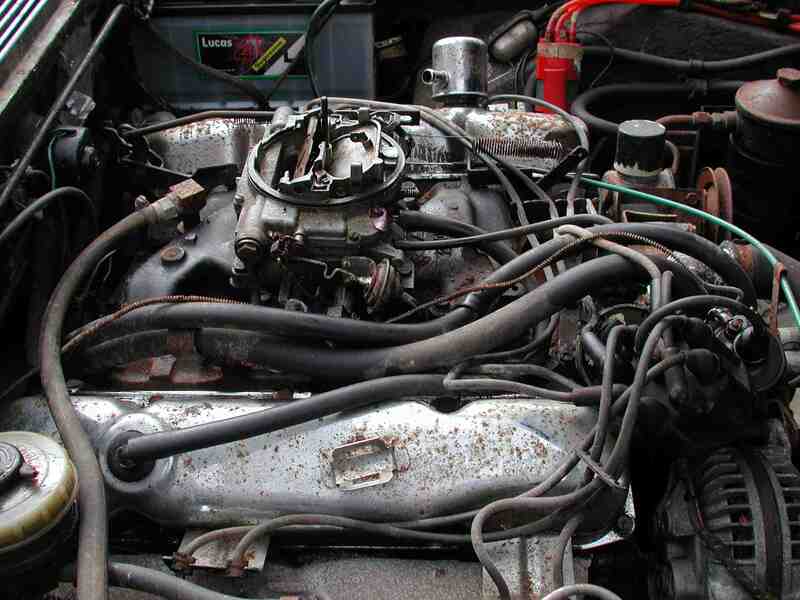 The Mopar Workshop Manual at page 14-42 (fuel system- AVS ) states that the 383 engine was fitted with AVS-4736S or AVS-4732S. I appear to have an AVS-4682S. What carb. do I have? Was it a replacement and does the “95” refers to the date? Is this good or bad”. My choke was giving me problems and appeared to stay on after just a short journey of 5 minutes. This resulted in difficult starting. I asked the list about a manual choke. 2. Same here. Bought new Carter AFB autochoke two years ago. Works perfectly under all conditions. 3. Yes, I agree that the autochoke on Carters (at least, the bimetallic one) is crude and overactive (like Ocker?). My conversion used a “universal ” manual choke conversion kit from Canadian Tire (our Halford’s equivalent) and a choke cable from a Triumph 2000 (I think). 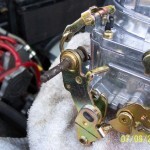 I used the kit for the cable clamps and pinch bolts, and the Triumph cable because it has positive détentes. After a bit of fiddling, I was able to adjust the cable so that the first two détentes move the fast idle cam only, while the last four operate successive levels of choke flap. On mild mornings, choke is required for less than ten seconds on start. 4. Check your accelerator pump. The diaphragm is subject to splitting or it could be set wrong (three positions are available rich medium and lean. The pump is the one connected to the throttle by a lever. Good luck. 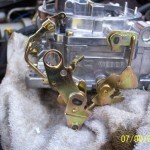 Then I decided that the spindles were worn, that I wanted more power and that after all an electric choke was tempting. 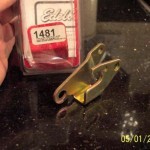 So I bought an Edelbrock 1406 Having bought it with the impression that it just bolted on I discovered a few problems. 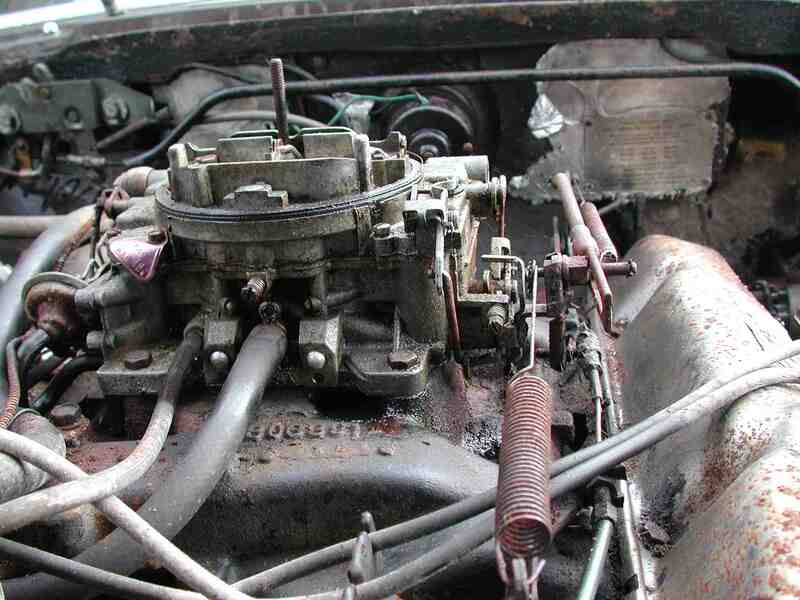 I’ve bought and now part fitted an Edelbrock 1406 (600cfm) carburettor to the 386 “E” series engine in my 1969 FF. I presume, from the fact that the air cleaner doesn’t fit without fouling the throttle levers that a spacer is required in my case. 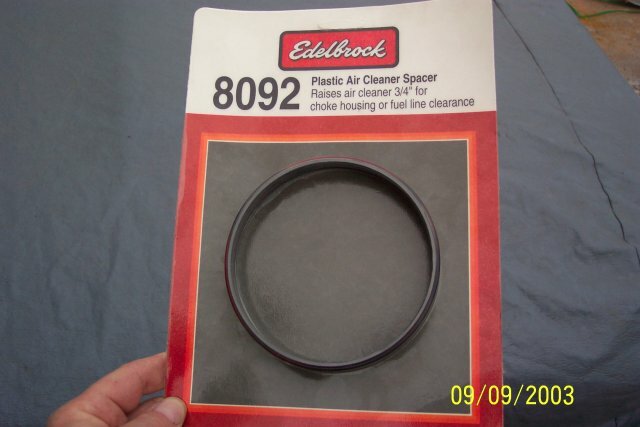 The Edelbrock manual mentions adapter my reference numbers. So I can ring Customvile or Rodley motors here in England and order the correct spacer does anyone know how thick this circular spacer is?. again I consulted the list…..Only problem at the moment seems to be fouling of the air cleaner by the throttle lever/kickdown linkage. 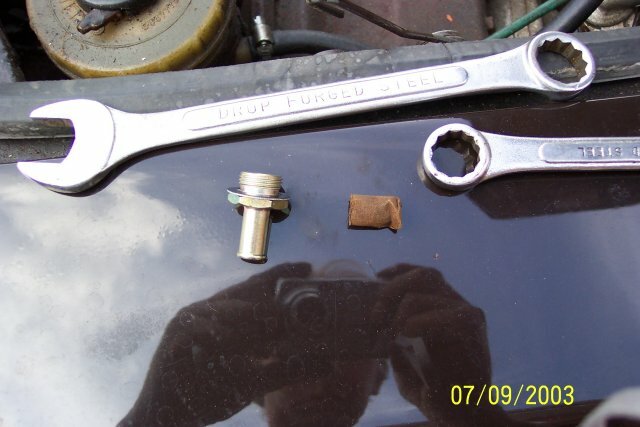 The one inch spacer shoved the air cleaner to high and fouled the bonnet, but sorted the throttle lever fouling. . I cut it in half (now an half inch spacer) and the throttle linkage fouled on the air cleaner again. ( and the eclectic choke). Still puzzled by the fact that the instructions say the existing steel fuel inlet pipe wont fit and mine does? and again I consulted the list……So what’s the difference between my 1406, 600cfm someone’s 1905 and the 1411 750cfm? Can anyone tell me if I chose correctly for my 383 or have I just dropped an expensive clanger? 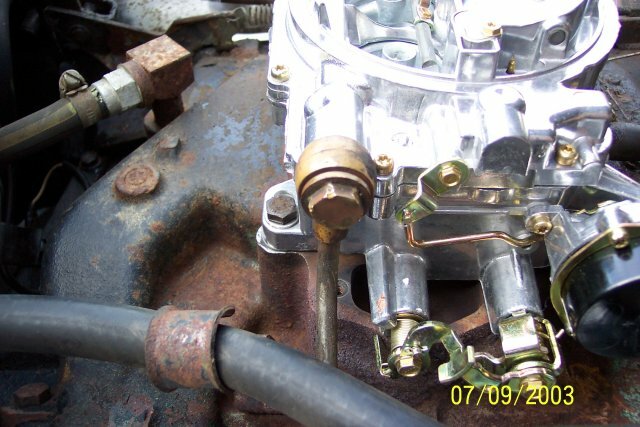 I looked at some Jensen notes where there was a reference to either using an half-inch or a three quarter inch spacer between the carb. and air filter. However, I’ve sent for one inch and hope it won’t hit the bonnet when I close it? 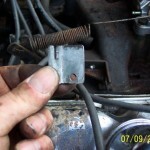 Someone mentioned the need for a kick down linkage. There was also reference to some cars having square bore manifolds and others having spread bore manifolds. 3. 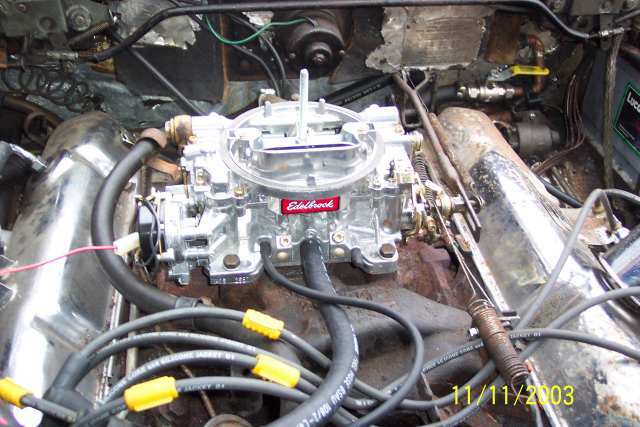 The Carter AVS is a square-bore carb, as is the Edelbrock Performer series you purchased. 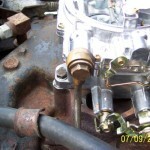 The spread-bore carb used on the Mopar products is the Thermoquad. 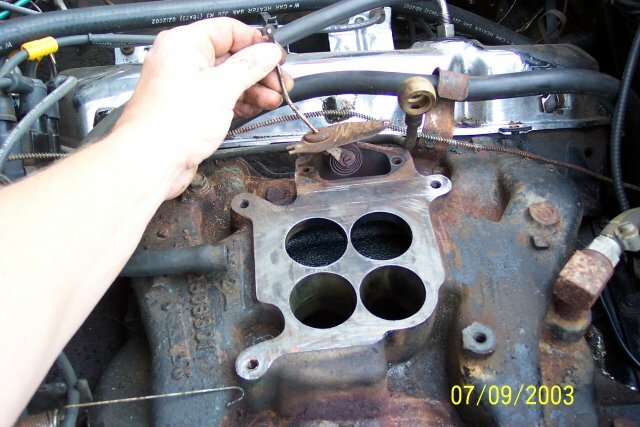 The 383 should have a square-bore manifold so only a spacer is needed, not the adaptor. BTW, even if you have a spread-bore manifold, you do not need a spread-bore/square-bore adaptor since the Edelbrock has holes for both. 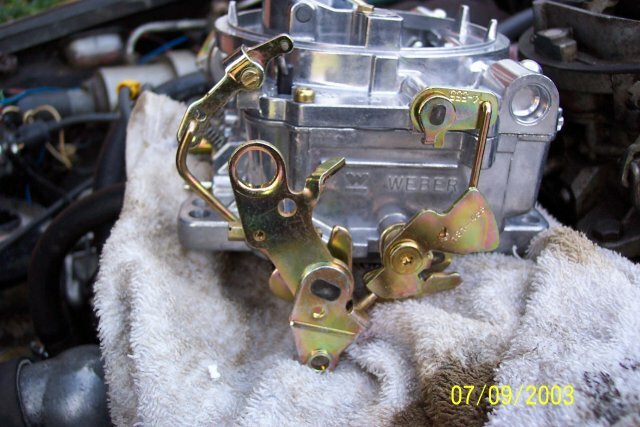 What you would need is a thin metal plate to seal the passages on the bottom of the carb, and it should come with the carb. 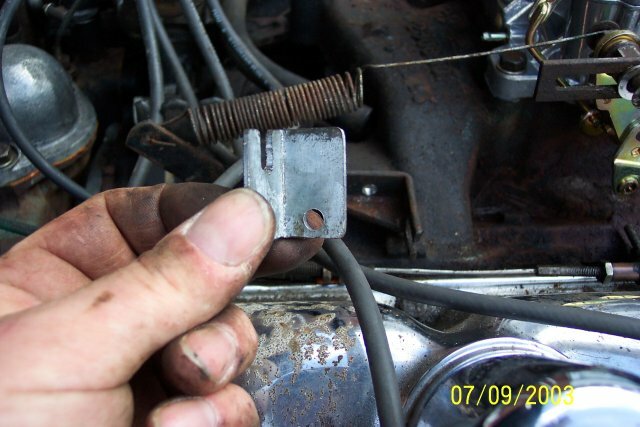 A spacer with gaskets would suffice. 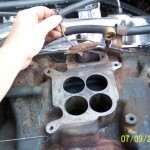 But since both carbs you are working with and the manifold are square-bores, you only need the spacer and gaskets. 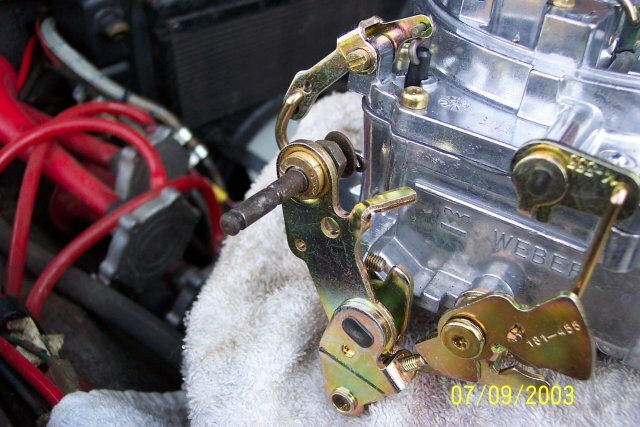 The Edelbrock/Mopar linkage adaptor is a simple piece to install so you shouldn’t have any problems there. A 1″ spacer is going to cause problems on a 440-powered Interceptor, but I don’t know about the 383. 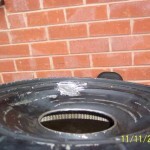 It might be close, so watch your air cleaner/stud and don’t dimple your hood! 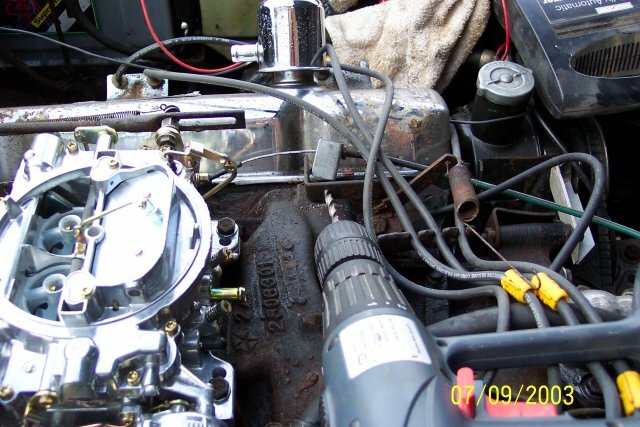 Until recently I ran an Edelbrock 1412, an 800cfm carb on my 440 with good results. I’m sure you’ll be happy with your carb choice. 4. Not sure for the 1406 but I fitted the 1905 and the spacer (which goes between the carb and manifold) is about an inch thick. For the 1905 it is apparently a must have in order to keep the carb body a little cooler – I think. 5. 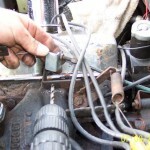 Some people are confusing the spacer that goes between the carb and manifold (to help insulate the carb. 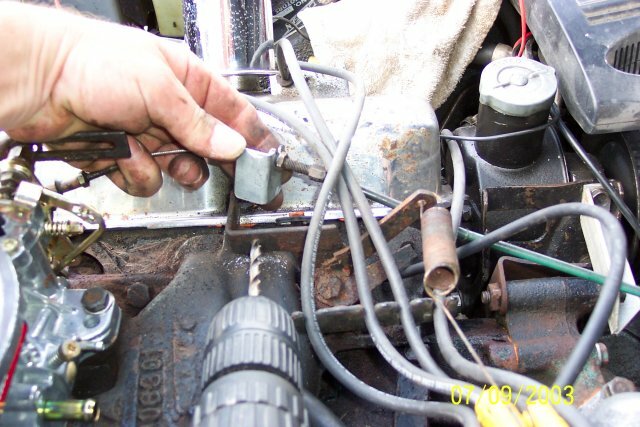 and help keep it cool) with the spacer that must go on top of the carburetor to give you the clearance you need for the linkages to move and to accommodate the round electric choke that you have on the Edelbrock and didn’t on the original AVS.
. The Carter AVS is named for its Air Valve Secondary venturis. The rate of opening of these is governed by the resistance of an adjustable spring (unlike the Carter AFB). 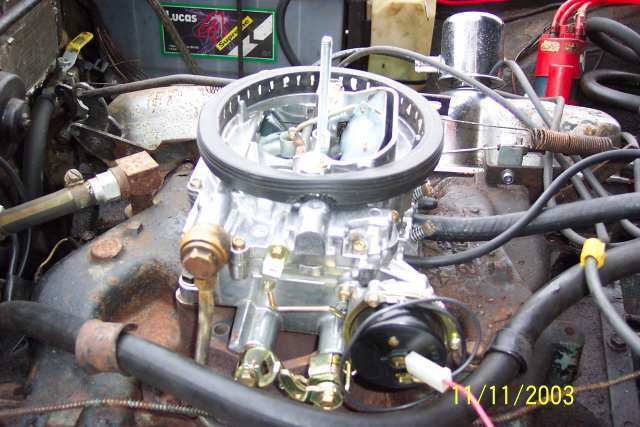 By 1957 engine sizes had increased to the point where a larger four barrel carburetor was necessary To meet this need, Carter introduced a completely new, lightweight design, called the AFB (for Aluminum Four Barrel).” -whose secondaries are governed by non-adjustable counterweights). 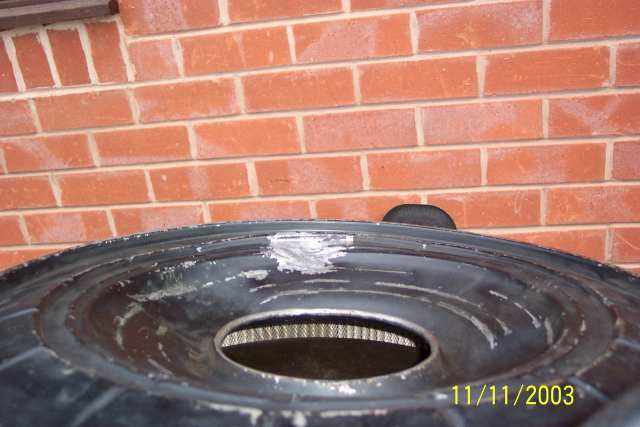 · Flat spots can be a problem when increasing the performance of your car. The Edelbrocks are notorious for bits in them. You should take it to pieces first and clean it. If you get any flat spots I was told to always check the accelerator pump first as the diaphragm may have failed, or may simply be set wrongly (there are three lever positions: lean, medium and rich). The pump is located high on the carb body, and is connected by its lever to the throttle sector. 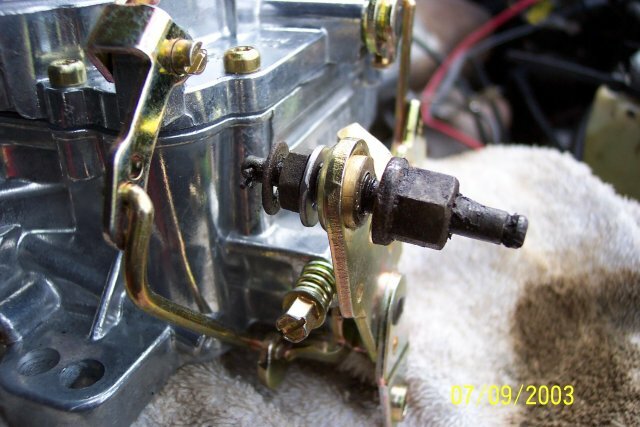 · Although the Edelbrock carbs appear to be based on the old Carter AVS design (since they include the ‘weighted flap’ to control secondary transition within the secondary metering circuit) They are actually the old Carter AFB design and are good, reliable and inexpensive. · Providing a cool air source will improve the engines performance and need not be plumbed directly into the air filter as long as it directs an airflow into the intake area, on race cars air is often ducted past the radiator area and dumped near the open carbs. 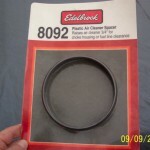 V8 air cleaners, however, do lend themselves to being hooking up directly to air ducting. The more oxygen you can jam into a cylinder, the bigger bang you should get (assuming fuel mixture is adjusted appropriately for the more oxygen). Cooler air has oxygen molecules that are closer together, and therefore, you have more oxygen. 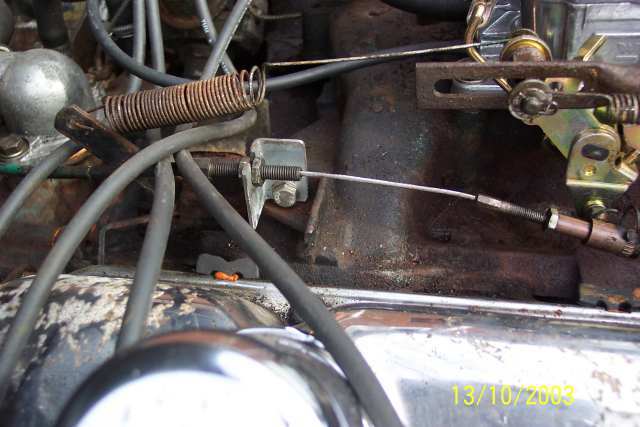 Photos showing the the kickdown linkage hole on the old Carter carb and the larger hole on the new Edelbrock carburettor .An adaptor is available but as I wanted to use the car that coming weekend I made up a suitable bush to fit the larger diam. hole and take the smaller diam. 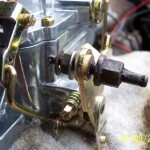 spindle that operated the original kickdown linkage. 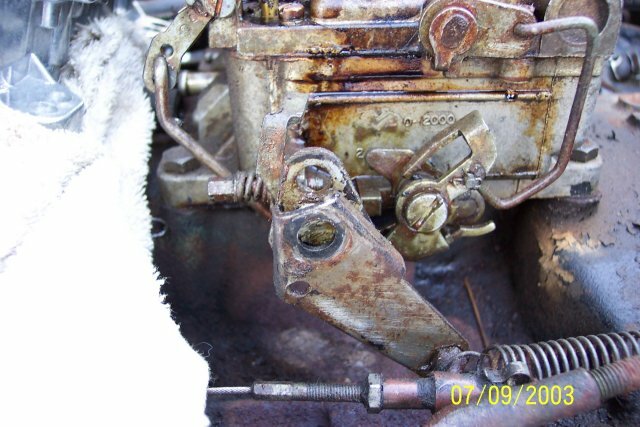 The instructions with the Edelbrock carburettor says that the original metal fuel line will not fit and must be replaced? 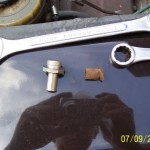 Mine fitted perfectly after removing the small gauze fuel filter. In order to get the throttle cable to fit properly/ function I had to make an adapter. 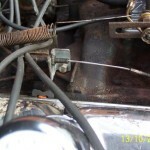 There was inadequate adjustment in the throttle cable in its original location (basically the cable was to long). I now understand that if I had been sold the kickdown linkage adapter at the same time it would have saved me this hassle as well as having to make up the bush (mentioned above). 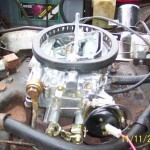 View of the Edelbrock carburettor with home made adaptor ring (correctly sized pram wheel bought from B&Q with the hard plastic spokes and rim bashed out to leave the moulded ruber tyre. At this point I came to an impasse. The air filter still fouls the bonnet but any lower and the linkages foul. 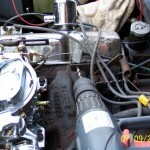 Photo of the Edelbrock carburettor showing the correct I hope vaccum tube attachment. The calibration Kits have a variety of rods, jets, and springs. He indicated that to change the rods is a 2-minute job and a 5-minute job if you change the jets as well.